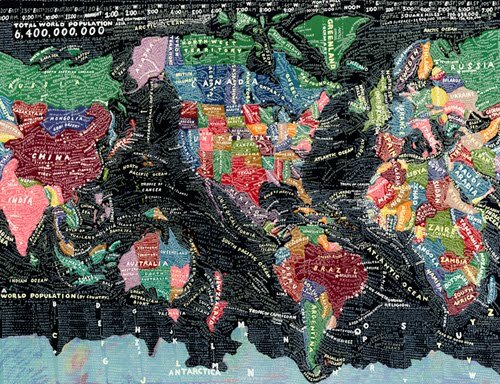 I've shared with you these amazing map paintings by Paula Scher before, but now the prints are on sale at 20x200. The size I would like (30x40) is a bit out of my price range, but you could snap up other map sizes for less. Although, I'm not sure why at the lower $50 range you can only buy randomly selected map sections -- so you wouldn't know what you are getting, but eh ... I guess that could be cool? Have a peek if you are interested, it is such a cool map. This is fantastic! What an amazing find. I'm obsessed with maps lately too. And globes. But the details and colors in this one are crazy. And expensive. Ugh. stop by and enter the giveaway! As a cartographer/map maker of sorts, I love this piece and her work! Thanks for sharing! I'm a sucker for unique maps!